These are the show notes to an audio episode. If you want to listen online, please use the direct link below. http://media.libsyn.com/media/airspeed/AirspeedLastPureThing.mp3. I’ve been volunteering with event-based airshow radio for three years now. 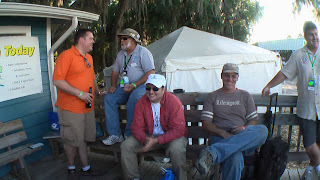 I’ve really enjoyed working with guys like Dave Shallbetter of Sun ‘N Fun Radio, Fareed Guyot, Mike Morgan, and others from EAA Radio at AirVenture, Erik Utter from Arlington Fly-In Radio, and Don Costanza and others from FlightLine Radio. It’s a crew of dedicated people that really understands what the radio could be if it would dare. And I might add that the airshow stations have been great about opening their arms to podcasters. 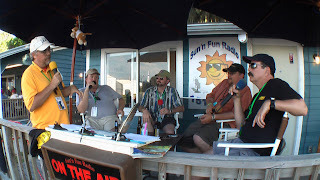 SnF Radio not only hosts the annual Gathering of Aviation Podcasters and broadcasts a couple of Uncontrolled Airspace episodes, but puts podcasters on the air right after the airshow each evening. 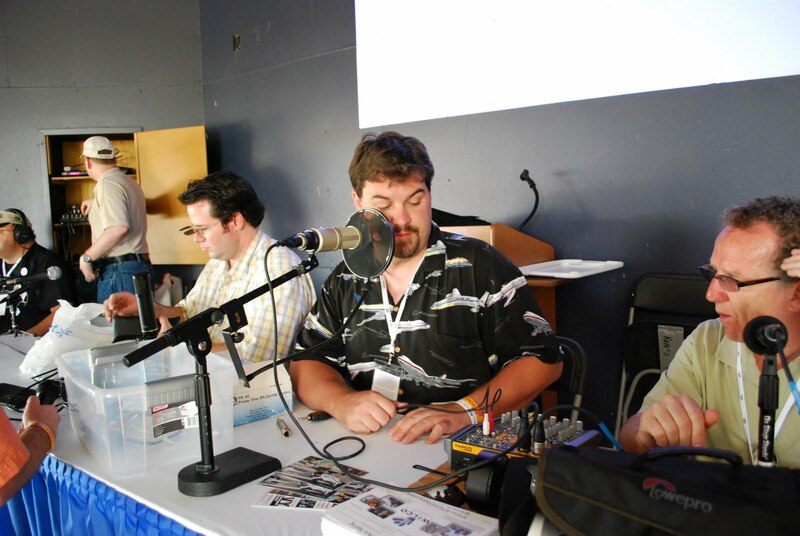 EAA Radio has UCAP on the radio a couple of times a week and hosts Podapalooza, now entering its fourth year. 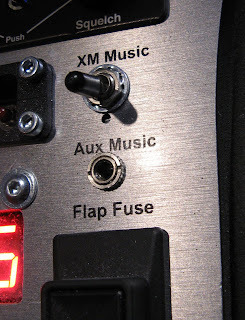 Arlington Radio has been broadcasting bits of Airspeed since 2006 or 2007. Flightline Internet Radio has put podcaster promos on the air and over the Internet for years. So last year, just before Oshkosh, I began mucking about with a tune in tribute to airshow radio. I fleshed out the tune and actually got around to recording it a few weeks ago and it’s ready to release. It’s called The Last Pure Thing on the Radio. I recorded the basic guitar, bass, and vocals at home and then went to The Soundscape Studio in Royal Oak, Michigan to lay down the drums. Then the whole ball of wax went to audio mastermind Scott Cannizzaro in New York for the professional treatment. Scott not only mixed the piece wonderfully, he added some musical elements of his own. And he was able to get a college acquaintance, Chris Wormer, to play slide guitar on the track. If Chris’s sound is familiar to you, you might have heard his guitar stylings with The Charlie Daniels Band. The artist name in the MP3 metadata is 7600, an informal band made up of music enthusiasts from around the country who collaborate remotely over the Internet. I generally release 7600 songs with the band name and then the specific folks who played or contrinbuted, so almost every 7600 song will show up as a separate artist on your player, but I think it’s worth it to identify the particular humans who had a hand in the process. I’ll post a link to an MP3 download of the song on the Airspeed website so you can download it and enjoy it for personal, non-commercial use. I hope you like it. 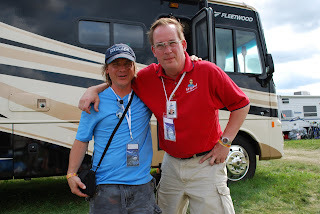 It’s dedicated to all of the volunteers that make airshow radio happen year after year. So, without further ado, I give you The Last Pure Thing on the Radio. Before The Man took it over and made it all blah-blah-blah. And some of it’ll spill into your ears if you let it. ‘Cause there’s a hill in the way. Or a tree. Or a gum wrapper. And there’s even dead air just then, but everybody understands. And I know you do the same thing. Picking up dead air at all the right moments. Crunch time yet again! I’m applying for a residency at The MacDowell Colony, North America’s oldest artist’s colony. It’s located on 400-odd acres near Peterboro, New Hampshire. At MacDowell, they give you a studio (read: cottage, barn, or similar structure appropriate to your particular art) and between two and eight weeks to just soak in your creative juices. No phone, no pool, no pets. A mysterious guy named Blake sneaks up to your door and leaves a picnic basket at lunch time. You head to the main house for dinner and chow down with the other artists in residence and feed off of their energies. For a really great encapsulation of the experience, check out the December 14, 2007 installment of PRI’s Studio 360 or head to the colony’s website and watch the short feature MacDowell Moments. Anyway, I’m applying as an interdisciplinary artist to write a series of folk songs and essays imagining the first folk music of the journey to Mars and back. All composed on instruments not larger or more massive than what an actual crew member would be expected to be able to take along in his or her personal volume and mass allotment. For me, that means, travel guitar, mandolin, Ashbory bass, music box mechanism, tin whistles, xaphoon, and other small instruments. I have to submit two pieces of my work along with the application. Sometimes Alternates Fly seems a no-brainer. The other will be a song of the kind that I intend to write there at MacDowell. The song, Eleanor Flies, finally made it into a tangible medium this weekend and I sent the tracks to Scott Cannizzaro on Sunday to mix. We’re through two mixes so far and I think Scott’s going to finalize it today. Then I burn it onto CDs, do the written parts of the application (actually, finish them – I’ve been writing pits and pieces since early 2008), and send the whole thing to Peterboro. 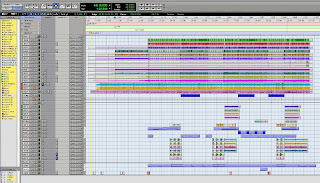 Shown above is Scott’s workspace for the mix. 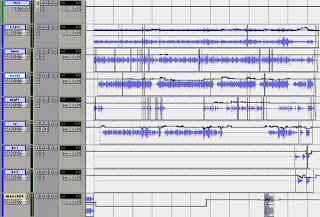 It’s kind of cool to see the whole thing as waveforms. His skills are well in excess of anything of which the music is worthy and I’m really glad to have access to his services. I’ll post the song here and/or to the show sometime soon. Probably after the application is complete. This is a regular blog post. Please check out the other entries if you’re looking for show notes or show audio. Scott Cannizzaro tweeted a little while ago to show me how the mixing session for Thunderbird Groove is going. I am so jealous of his setup (not to mention his mad skills)! Somehow, my Audacity sessions just don’t look as cool after seeing this. I need to get a Mac or something similar onto which I can hang more audio and video editing functionality. And really play with the stuff to figure out what else I can do. This just looks so fun. Will I ever have the kind oar that Scott has? I doubt it. And that’s probably 80% of what goes into coming up with a really great mix. I FedExed the remaining tracks to Scott for arrival today (the studio at which I did the principal recording mixed the electric guitar and bass in the same .wav file, making it less than useful for mixing). Not sure that they’ll actually be necessary because the mix that Scott sent over the weekend is pretty cool. Although I might be saying that because I’ve been listening to little else since then. Having the music available has really gotten the juices flowing on the writing end. I’m busy as hell at work and home and it’s really hard to stay focused when I have nearly all of the makings of the best Airspeed episode ever just sitting there ready to be sewn together. Stay tuned! I’ll probably release the first video episode f the podcast shortly. It’ll be the in-cockpit video from the Thunderbirds ride along with music and footage end editing stylings of Will Hawkins of Wilco Films.